Crop circles - Various 3 - documents. Explanation, decipher, decode, discovery, break code, explaining, decryption, puzzle out, scientific research. Of course it is not possible to say that lightning strikes are the only solitary causes of field crops weakening, long-term humidity or dryness may also vegetation significantly weaken. It is possible, based on already statistically significant number of observations (2008-2010 - 100++, 2011-some other), pronounce a preliminary hypothesis, that the present state of of agricultural technologies used and the level of breeding varieties and hybrids, corn or many other crops, are almost never lodged (damaged, weakened) anywhere but there, where the point was hit by lightning, and sometimes not even there, as follows from some negative observation, for example Stratov 2009. Indeed, most commonly after a number of days, as well as weeks after the lightning hit into the crop plants begin bend to the ground, may attend other, clearly secondary, consequences of damage by the electricity - attack by plant and animal pests, various phytopathological changes. Firstly is flattened (damaged, weakened) the crop nearest to the point of intervention, then other, less affected areas, the time between lodging (damaging, weakening) of the first, the most affected areas and the last, least affected may also vary by up to several weeks. In another place is considered the possibility of Two Lightning Discharges to approximately the same location, when the second discharge falls into an entirely different crop in a very significantly weakened condition. It is also necessary to take into account that lightning may not just fall into the field, it can branch out and hit various objects in the vicinity, el. lines, poles, rails, trees, buildings, power and overhead lines, so can sometimes end up in a field only a tiny percentage of energy, but in some other cases may be affected almost entire field with a single straight vertical lightning discharge, by all the energy that is concentrated in it, including all of its possible subsequent discharges. Noted a case, when after "an average" discharge flash (6 kA) - extremely heavy rain, during approximately 30 minutes fell several dozen mm of rainfall, was lodged (damaged, weakened) the whole field of approximate area 6 hectares, very irregular shape of field (foto , 2 hours "after the action" after the discharge). Almost completely lodged (damaged, weakened), 80 - 90%, points not lodged (damaged, weakened) distributed very randomly. Consultation with a local farmer discovered that before the storm was not laying on the ground even a stalk on that field. The surrounding fields untouched, their condition unchanged in compare to their previous state, known and periodically controlled before. (including the nearest, distant just about the width of the field path), hailstones would be unable to hit so selectively in a single field, yet so irregular shape. Lightning and thunder following were registered visually and acoustically, computer from which they are routed to the world this informations located 1700 meters as the crow flies from the "crime scene". Hailstones not registered. Sometimes may occur a situation, when there is a complete discharge conducted to the ground by some at that location present an artificial or natural lightning rod (a tree, HV pole ), but still underground occur electrochemical and thermal (physical and thermochemical) changes in soil and current flowing through plant roots, which over time may show changes in their growth. In the underground, there was radiated at most only 1 percent of total discharge energy, the vast majority of it radiates when traveling through the air - heat, light, majority of electromagnetic radiation, mechanical energy and sound. Due to the energy that is transmitted by an average lightning, there may still appear underground a relatively large amount of energy, and much more in the case of above-average discharge. For example, in a film document named "What On Earth; Inside the Crop Circle Mystery", Suzanne Taylor, 2009, (never, never, never observe this document, it may leave a very serious negative mental health consequences and deep lowering psychological well-being), there are dowsers walking through the fields like Furious and dowsing rods in their hands are rotating as the wheels of socialism. 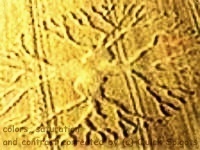 Similar images may be monitored in almost every document with subject Crop Circles. Unfortunate dowsers do not realize at all, that they only identify the springs or geological faults, that were in place long ago before the main cause of creating patterns in the crop - the lightning discharge, but but could act as a reliable lightning conductors. Quite another reason for the increased sensibility of many dowsers and other individuals may also be the presence of many highly poisonous gas toxic chemicals. Their presence on the site has never been proven, it will be necessary to wait until some time. But even so, or rather above all, precisely because to all the dowsers belongs great thanks! Thank you very much, dear dowsers! 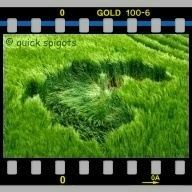 National Geographic - Is It Real - Crop Circles - 02:33 (foto). Very, very, very often performed far the largest part of the work in any field of human activity precisely those researchers who have also to the whole world during the same time very clearly announced "Never use this way, friends". So far all the movies listed here yet, but certainly 99% others of course contain references to the existence and samples of activities so called hoaxers or circlemakers. They are trying to emulate something on their own, what in fact in much better form produces someone completely different - Mother Nature in conjunction with electromagnetic pulses of her own generation, therefore it is or will be on page Summary presented a calculation of comparison "earnings" of hoaxers and the real author. Hoaxers are payed there several tens euro in a hour. The events must invented, shapes designed, build utilities, transport to the site, and those beers they drink at the same time... Although, similar events are almost made up primarily for TV or film documentary? But this question may be left entirely aside. Let's say 30 euros per hour, even the brain sometimes used, so that, say, five hours of work five -member team (design the shape, location selection, preparation of aids, transportation to the place of work, documenting it all, amortization of the means, return back and the evening beer) around € 750 *) . Lightning discharge needs to create a much more complicated, more accurate and better work time not exceeding 150 millionths of a second, but will be evaluated by the same amount. On the picture of the average curve current during the discharge with five successive Return Strokes is possible to see that the net "work time" period during which current is flowing (99% energie), lasts together about 150 microseconds. Time, in which the flow does not take place, tens to hundreds of milliseconds between subsequent discharges, is the time of the work delay and rest, when the discharge really stopped working, the reward is not fundamentally possible, these are downtime and lightnings have not given labor unions yet. 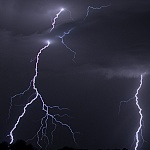 A simple calculation reveals that lightning earns 750 euros for 150 millionths of a second, approximately 5 million per second, which is 18 billion euros per hour. Here will be named several a more or less marginalized or completely neglected "stepped leader formers", ie circumstances which may assist its formation. Stepped leader - initial stage of lightning discharge establishment, prior to discharge itself (Return Stroke, strongest and most powerful part of the discharge). During Stepped leader are gradually interconnected pre-ionized paths between cloud and ground, and followed by further positive streamer. 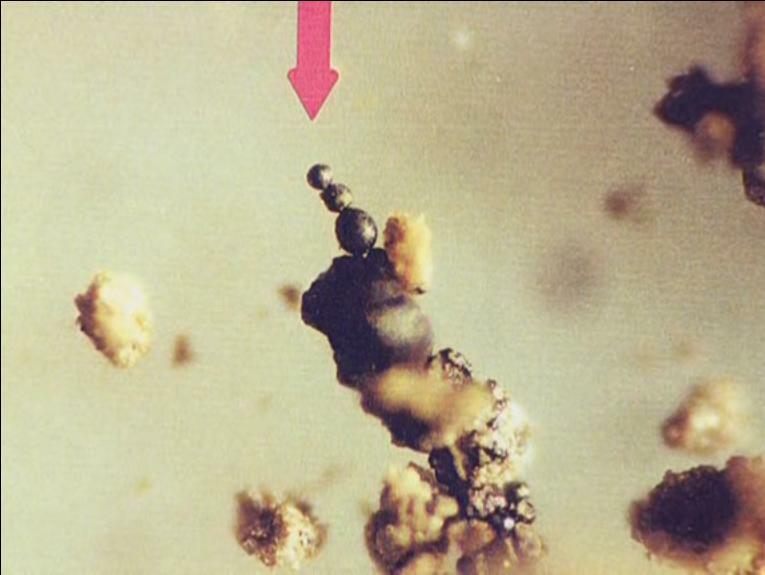 This represents something as a confirmation of a link that seems to "run upwards" to the stepped leader, establishing contact in a small height above the ground (tens of meters). Only then will take place Return Stroke - major and visible discharge, during that discharge between cloud and ground currents of tens to hundreds of thousands of amperes. The previous two are almost invisible, and "work only" with currents of tens to hundreds of amperes. As the lightning conductors work in many cases piles of manure, also tram lines. Tram lines are reflected very strongly, and designs often copy their shapes. There occur because of them (tramlines) some interesting features which will be described below or at the special pages. The issue of the formation of lightning discharge will be processed much more detailed on the page Physics. The circumstances that precede the Stepped Leader itself are described as Preliminary Breakdown (The Lightning Discharge, M. A. Uman, Dover Publications 2001, p. 71). During the Preliminary Breakdown are formed conductive paths in the air, which are characterized by higher conductivity and during the journey from cloud to ground may Stepped Leader be conducted through them. For example, from piles of manure are continuously evaporating various vapors strongly dissociated, increasing the conductivity of the air above them by several orders of magnitude, to the heights of tens and even hundreds of meters in no wind. 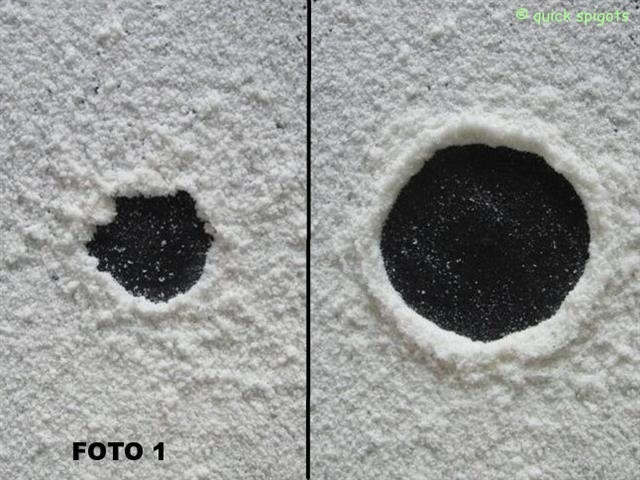 Below the result of an experiment with effect of the shock and pressure waves caused by discharge electricity from the capacitor (2500 V, 10000pF, ie approximately 0,03 Joule, discharge length of approximately 1mm) in a granulate material (flour). Creates a very regular circle (diameter of about 11-18 mm), the more regular, the more repetitive discharges take place. Shock wave and after that immediately following pressure wave (to that shock - supersonic wave weakens) of electrical discharge with multi-billion Joules energy (average lightning), is approximately a hundred billion times (1011) stronger, than that used in the test. Because the mechanical effects of the discharge (Concerning the relationship of the perpendicular discharge line due to the surface) decreases approximately as the cube of the distance (more precisely, somewhere between the second and third, say, closer to the third), if the field instead of wheat was lying flour (sand, grain, salt, any powdery material), would be no rain and no wind, it would create a circle with a diameter of approximately 15 to 20 m. To the same distance will reach the mechanical effect of the same shock and pressure wave. Does not bend them to the ground, lasts only a split second, but stalks may be significantly mechanically damaged, and together with the induced and directly passing currents significantly affect the vitality of plants and cause lodging (damaging, weakening) of plants up to in the distant future. Similar experiments with powdered Fe2O3 and Cr2O3, which simulate the magnetic properties of the temporary straw during discharge - not fake or hoax, attempts are easily practicable and reproducible at any time. The coil exhibits inductance, its line exhibits resistance, therefore they can together create a RC element, that exhibits a resonant frequency, and this is the most crazy. Another very important factor, which adversely affects plant health, is the dispersion energy underground and passage of the current through the root systems of plants, and electrochemical and thermochemical processes in the underground, contributing to the formation of highly reactive radicals and from them arising (more soluble) compounds that may also adversely affect plants. The fact that some circles are lying clockwise and other counterclockwise, need not be caused by the direction of flowing electric current during exposure, but only by a mere accidental mechanical impulse at the moment of lodging (damaging, weakening) - For example, the predominant wind direction at the moment of lodging (damaging, weakening), and in place, where the Domino Effect starts. Using the Domino Effect may be explained also often in the center of patterns standing clusters of stalks - groups of falling stalks stalks are like going round them. Many Crop Circles contains something that would be called a "digital signature". Several small circles with a diameter of 0.5 m or less, sometimes lying very far from the patterns and are completely neglected by phenomenon explorers. They are places, where fell weak arms of the discharge. 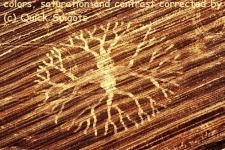 Certainly are found sometimes also on great fields with "patterns" of completely irregularly flattened (damaged, weakened) crop, without any additional larger regular pattern, and those will be by Crop Circles phenomenon explorers ignored even more. But this is mainly to confirm the authenticity of the natural, not manmade, origin of such patterns, because brains of D&D are too simple and empty to make anything like that. A speciality of the website cropcircles.cz is the fact, that almost without exception, certainly much more than 90% of agrosymbols discovered in the Czech Republic indicates as "probably hoax", that mean manmade patterns. There is possible to strongly oppose, well over 99% are only and only genuine, created by purely natural forces. Much more precisely, 99.9999999%. So many idiots, in addition to such a great, probably are not in the Czech Republic, and probably throughout the whole world. On the other hand, if all the idiots of the world did nothing more, than creating Crop Circles, although the other problems would be significantly decreased, but there would not be what to harvest. Although that combines aka harvesters have the lifting devices. At this point it necessary again to strongly warn any possible Crop Circle Makers, to nevermore attempt the making of patterns, or once will be really meet them the only one true creator in the field. After that, there will be on that field prepared for harvest themselves, their stationary cooling bodies. But after that will then harvest Men in Black (car). There happened something above the field, what is possible (force effects) to compare with an explosion of hundreds, in extreme cases even many thousands of kilograms of TNT at a small height above. Incidentally, after the explosion of explosives anywhere in the world, just above ground or near below is always and only created circular crater... (as well as after the impact of any object in the water are created solely and only circular waves on the surface). The nearest analogy of the lightning discharge in the field from the mechanical point of view would be an explosion of detonating cord, weighing at least several hundred grams of explosive per meter, hanging up and exploding close to the field surface from the height between several hundred meters up to to several kilometers from the sky (greatest mechanical, and electrical discharge effect on the stalks could be expected from the part located up to several tens of meters above the field). The Lightning Discharge is quite a complicated issue, which is possible to read about in a number of specialized publications, among which stands out mainly Lightning: Physics and effects, V. A. Rakov, M. A. Uman, Cambridge university press 2003 (2007), ISBN 0-521-58327-6. Both authors are reliably to be considered as two worldwide "GURU" in the field of lightning discharges physics investigation. Here will be mentioned just a simplified few basic facts about the negative cloud to ground lightning (the most common case, 4 chapter of the book, pages 108 - 191). The most important components of the process of forming the discharge are the Stepped Leader or Dart Leader (SL, DL, eg. page 109), which move from the cloud towards the ground, and when it approaches to within a few meters, starts out to them from any substantial, often well-grounded object on the ground surface (conductor, manure pile), in opposite direction Upward Connecting Leader (Positive Streamer), both contact altogether several meters to tens of meters above the ground and the Attachment Process will happen, which finally connects that two locations - the ground and the source of the charge inside cloud - originally with a huge potential difference (up to several billions volts) conductive channel, say "by wire", and only a few millionths of a second after the link is followed by the main "show" or a "fireworks" - Return Stroke, capital and largest discharge, although lasting only a few tens to hundreds millionths of seconds, with peak current up to several hundred thousand amperes. Only Return Stroke is actually possible to observe, the two preceding phenomena are almost unnoticeable and can be only registered a sensitive measurement and registration technique (their currents are 100 - 1000x weaker). Much more details about Lightning Discharges, their physics and energy, obtained from that mentioned and several other publications, is or will be possible to read on the pages and subpages of menu Lightning. The most important part of the whole discharge process is Return Stroke or its subsequent strokes, also named successive strokes or re-strikes. Their time interval after the first R.S. or between themselves is several tens to hundreds of milliseconds. In their case it is a completely common physical phenomenon - passage of current through conductor, through which flow in top tens to hundreds thousands of amperes, and produces in their vicinity electromagnetic fields, incredibly strong. Such a strong field may be produced in the laboratory (tenths to units of Tesla), but not on such a large total area and never with such a steepness of leading edge. Current varies at speeds up to many tens of thousands of amperes in a single microsecond (millionths of a second), some subsequent RS up 200 thousands A/µs. This is thus very different from compared detonating cord explosion, that is able to prepare to the audience only visible and audible performance. In contrast to it prepare the lightning discharge another performance - totally invisible, containing (emitting) the same or even higher energy - enormous electromagnetic explosion (something like a little similarity of an electromagnetic pulse following an atomic or thermonuclear bomb explosion). Steepness of the leading edge of this pulse is by itself something that might never be (from the electromagnetic point of view) able to prepare in a laboratory. The rate of current rise is therefore necessary to mention, because it plays an important role during the process of induction voltages and currents in the surrounding objects, including plants, but also in plant roots and soils. There is no need at all particularly luxuriant imagination to derive the conclusion that the current momentum, reaching peak values, say, 800 thousand amperes, which runs along the path space, say, speed of 8 km 200,000 km per hour, with leading edge sharpness 200 000 amperes per microsecond (millionth seconds), at impact point create interference and resonance character somewhat larger than a mere "slap in the water." Current impulse itself, especially its most powerful part, never lasts longer than a few tens of millionths of a second. Carries a huge electromagnetic energy, can create an incredibly vast and incomprehensible regular resonance and electromagnetic interference pattern. Some of it may be in the structure of plants in the field recorded, see Exposition. Action of several such consecutive pulses at different time intervals and distances may arise very complicated interference effects, although very short. Unlike electromagnetic radiation, the mechanical consequences of such rapid and intense, extremely energetic impulse at impact can persist up to several seconds. Plasma column begins to expand very quickly to the side, initially at supersonic speeds, which over time will slow down to the speed of sound, and even later to subsonic. Until its speed drops below, say 300 km / h (one-third the speed of sound, still far above any ambient wind), will be its shape and spreading managed by primarily its own, laws and rules. Initially will spread to all sides very evenly, as a very accurate circle. It is also very likely, although still very difficult to verify that at least in some cases, whether the most powerful or just average lightning on the spot creates a vortex ring. That during the high-energy local changes in gaseous environment arises very often. Whatever above ground performed nuclear or thermonuclear explosion creates the famous mushroom. It is possible to see that simultaneously is every such mushroom combined with a much faster sideways spreading vortex ring (supersonic speed), though less noticeable and perceptible. Also possible see only quickly spreading detonating wave, much more faster than mushroom, in the shape of exactly precise circle. 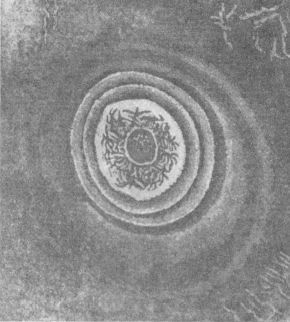 The existence of vortex rings on the spot after the discharge of lightning is very difficult to prove, mainly on the grounds that every potential witness, which occurred at a similar location, certainly not photographed, nor would definitely try to observe what physical phenomena are taking place on that spot. His only worry at that time namely was trying to save his own life, and in that time, mostly for an observation really, let alone photographing or even performing experiments, great deal of time is not left. No choice but yet integrate own imagination into research, and try to imitate happens through computer models and possibly much less energetic physical experiments. It is possible, for example, note that compared to some rarely occurring lightning discharges is currently being built, although most energetic laser in the world Břežany what the generated and transmitted power, a mere "flivver". Involvement of imagination in scientific research is not anything malicious, just remember, what mentioned about its usefulness especially for any scientific research for about hundred years ago, some Mr. Einstein. Although induction is only possible to produce by alternating current, but even a single lightning discharge is possible to consider as one half-cycle of alternating voltage, which is as a common process induced in any conductive objects in the vicinity. Much more precisely defined, in the surrounding objects are induced each rising and falling waveform edges of electric current. These phenomena are very closely involved in electrical standards related to lightning protection, see (EN 62305). The electromagnetic effects can also be multiplied by concurrent, skew, parallel arms of the same or subsequent discharges (re-strikes) and their parallel arms, which, all together possibly electromagnetically, electrostatic and mechanical (sound vibrations and low-frequency earthquakes - lissajouss figures) resonate and interfere. Immediately during the Return Stroke, or some subsequent discharge would be possible measure immediately in the lightning discharge channel voltage "only" round 100 - 300 thousands V/m. This value is in considerable contrast with sparks jump voltage through the air, which is at 0-90% of moisture at approximately 3 million volts per meter. At 100 % or higher humidity (saturated vapors), for example, just above the water level, but this value drops down to just 100-300 thousand volts per meter. (strongly not recommended to be tested and measured just on that point - such explorers therefore would continuously decrease in quantity, and thus they would be need to be replenished at overmuch short intervals). Just before this discharge occurs, is between the cloud and the ground in certain places voltages up to several hundred thousand, as well as over a million V/m (the same case, do not measure there anything in person). A note: while all the previously mentioned hypotheses and theories are intended to act entirely seriously, will now be inserted one a little bit "crazy": Tram lines in the fields, that tvoří significantly more conductive environment to neighborhood, in the recesses is accumulated much more humidity also standing water (foto). Moisture keeps the longest there (verifiable and verified), created as naturally produced reliable functioning lightning conductors, into that many lightnings hit and along which pass through as like as in a roller coaster. From several observations it seemed (Google Earth), that in English fields coils are very often short-circuited through the turns, as opposed to eg from Czech, but it was a mere supposition based on a not very statistically reliable sample. Later, also observed in Czech short-circuited coils, and statistically significant survey of aerial photographs (hundreds) found, that the opposite is more exception, so the first impression was probably accidental. Along the tram lines is damaged crop ( lodged (damaged, weakened) ) due to discharges flash very often, and very often near the center of the quarter turns (images); or even random local "more than just a quarter turns"photo, photo (one this year - 2010 - caught, anything from L.P.). 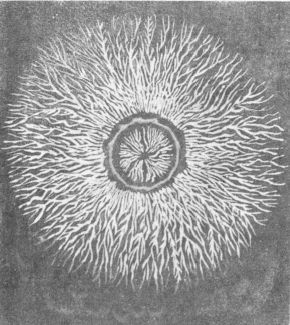 For the Brittish Boys created the term "Lightning Forming Crop Circle Theory"
Sometime Crop Circles really look like photographs of positive or negative spark discharge (Kirlian photo, Lichtenberg) , Crop Circles and discharges. In the case of some another Crop Circles are their explorers surprised by their fractal structure. Fractals were discovered in mathematics relatively recently (1905, with graphical computerised representation 1975). But it is important to realize that nature had always known fractals - atomic structures compounds, galaxies, various structures of plant and animal organisms, coniferous and deciduous trees, their root systems and other plants, vascular and nervous systems of animals, rivers, mountains, clouds, snow flakes... Even a very frequent possibility of the excess charge discharging is carried out by fractal structures. 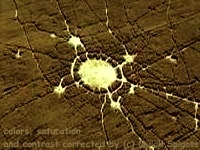 Almost every lightning represents a fractal of itself, some form even extreme cases of fractals. Much more typical example of a fractal than the actual lightning is Stepped Leader, but that is almost invisible. But there are also film records, where it is visualized on, it is just possible to see there. - additional estimated and explored possibility is, that at least some regular patterns occur so, that in the same place lightning hit twice, with a long interval (days to weeks). The first of these, only "set the scene" (produce up to several billion "pre- exposed", weakened stalks, however, that despite what happened to them, are not lodged (damaged, weakened) yet, to that the next discharge following few weeks acts much more easily. Again, another similarity with classic photos, when it is possible some of the highly sensitive layers exposured to small amounts of light, kind of pre-exposition, sensitize the layer to an even higher sensitivity.The difference in mechanical strength and force needed to bend or break stalks affected and unaffected by the current is huge and is between tens to hundreds of grams (bending) to many kilograms (break). Highly depends on the time elapsed since the intervention electricity, weakening of plant tissues after it is in very slow progress. Vegetation unaffected by lightning and not damaged by electricity does not bend to the ground even under the most violent storm also in interaction of rain, when the crop is under influence of wind well over 100 km / h and forceful water flow, yet even a stalk is not lodged (damaged, weakened). Those affected and not immediately flattened (damaged, weakened), will be flattened (damaged, weakened) no more than after a few weeks alone, or after a light breeze, or when they are heavy thanks to morning dew or a light rain. 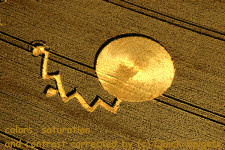 Crop circle snamely after the lightning discharges do not arise in every field (an estimated a millionth or less of cases), but SOMETHING, just a fairly ordinary something occurs almost always (a message number two). A message number two: Almost all flattened (damaged, weakened) crop (95% even more, ie about a million square kilometers per year worldwide) are caused by lightning discharges in the fields or just above them. 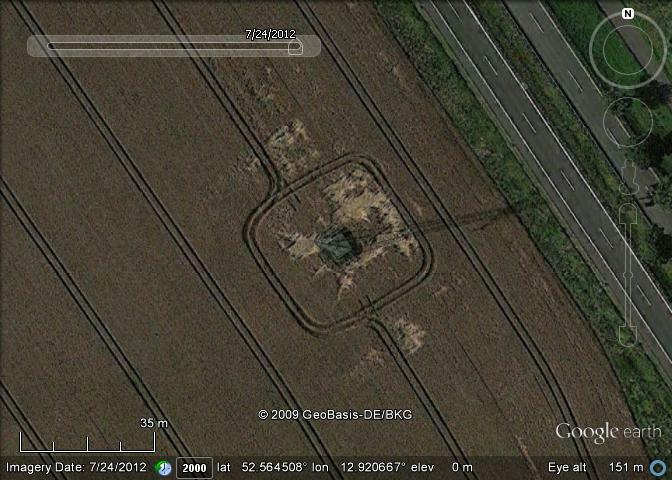 Mention was earlier in the text and the picture - the whole lodged (damaged, weakened) field in Benatecka Vrutice. 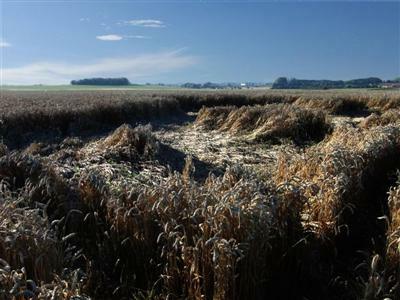 As with crop circles, also in the case of irregularly lodged (damaged, weakened) crop, and there is quite a common rule, that the crop will be flattened (damaged, weakened) sometimes up to several weeks "after the event", so immediately after the storm, while farmers very often leaving lands after inspection quite satisfied, because seemingly "nothing happened", know that in many places it is already "planted" or better said "exposed" to a big mess and destruction. While even after a very powerful storm was not lying on the whole field even a stalk on the ground, after several weeks, during beautiful sunny weather, interlaced here and there by only occasional slight rain, bringing that much needed moisture, unhappy horrified farmers only watch, as there were under these ideal conditions "fall asleep" (lodges) considerable part of the field and will be very difficult to harvest. 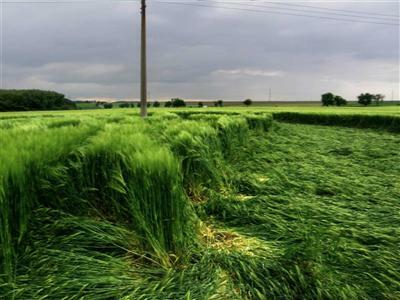 Farmers are accustomed to associate a lodged (damaged, weakened) crop after the thunderstorm primarily with jointly acting hailstones, so unless the crop is not flattened (damaged, weakened) immediately after the storm, matters are already not dealed by them so much. Po světě běhá hodně průzkumníků jevu kruhů v obilí, kteří zanechali slibné kariéry ve fyzice nebo elektrotechnice a měli z ní kdysi zřejmě hodně nastudováno.